The perspectives of the Balanced Scorecard help to establish a cause-and-effect logic for the strategy map. Learn how to properly map business goals into the Finance, Customer, Internal Processes, and Learning and Growth perspectives. It is a strategy execution framework developed by Robert Kaplan and David Norton. In this article, we will be talking mostly about its four perspectives. If you are interested in a general overview of the framework, I would recommend starting with the “Putting It All Together” article. Here are the general principles to follow when building a strategy scorecard with four perspectives. The perspectives of the Balanced Scorecard are not just the visual containers for the goals – they help to explain the cause-and-effect logic of the strategy. The logic flows from bottom to up: goals from the lower perspectives contribute to the goals from a higher perspective. Four Perspectives Example online, sign-up with a free account to unlock all functions. Finance Perspective), not vice versa. “Customer” perspective is not a guarantee that execution of one goal will lead to the successful start of another goal. All goals are the hypothesis that we need to confirm. Many “balanced” scorecards are just a set of independent indicators sorted into the four perspectives. Those are KPI Scorecards. They help to measure many aspects of the business but don’t shed light on what strategy is and how it will be executed. Align indicators with the goals on your map, and make sure that indicators are not dominating your scorecard. Business goals should dominate it. We map business goals into the four perspectives of the Balanced Scorecard. How do organizations come up with these goals? Here are some suggestions. One way to formulate a goal is to project one of the generic strategies on your current business challenges. In the article below, we will be using this technique often. The Balanced Scorecard is normally created for an existing business. Where are the main costs? For example, we followed this approach when designing the Balanced Scorecard for customer service. We started by mapping key processes, costs, and main growth points. There is a video tutorial that explains the details. It sounds like a truism, but on the Strategy Scorecard, we are supposed to map strategic goals. We discussed before the difference between strategic and operational goals. My short recommendation would be to focus on the goals that would impact the performance of the organization long-term. A good goal responds to some challenge. How all these ideas can be aligned with the strategies you already have. That’s a short version of the strategy journey approach that we discussed before. Why Do We Have These Four Perspectives? The need to use four perspectives and specifically these very perspectives can be proved in practice. Check out the workshop example that we discussed in the “CEO Scorecard” article. Are there some alternative approaches? Let’s start with the variations of the original Balanced Scorecard framework. For example, some companies add a “Resources” perspective or rename the perspectives. If the cause-and-effect logic remains untouched, we can say that we are still talking about Balanced Scorecard. For sure, there are some experiments that have little to do with a K&N Balanced Scorecard like for example, Tesco´s scorecard or a scorecard with 12 perspectives. 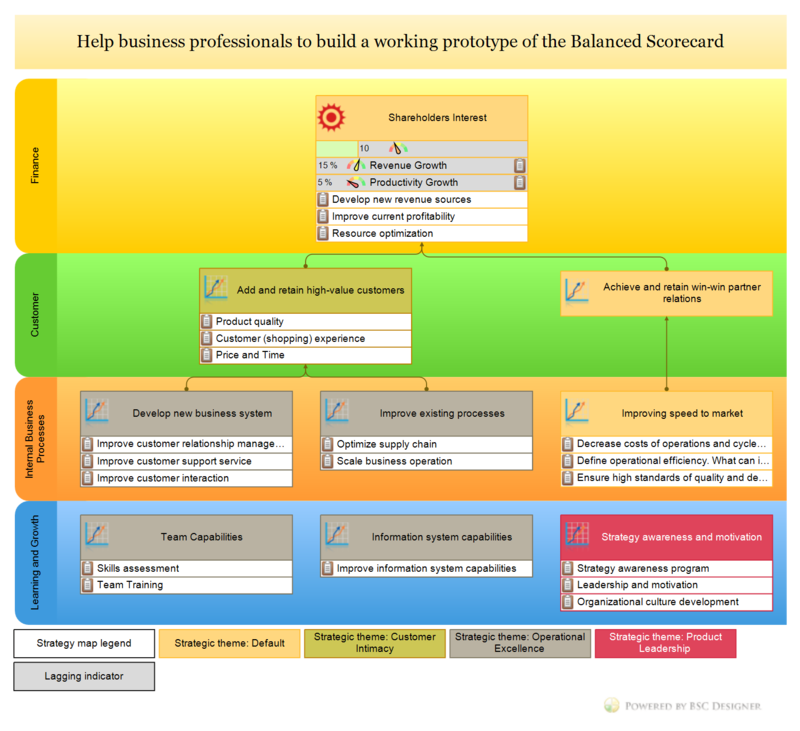 There are several emerging versions of the Balanced Scorecard that are worth looking at: most notably in my opinion the Value Creation Map pioneered by the Advanced Performance Institute in the UK. The scorecard also works well alongside frameworks such as Malcolm Baldrige or EFQM. What’s the Benefit of Having a Strategy Map? The key benefit of using these four perspectives and the Balanced Scorecard strategy map is that we can describe a strategy effectively. A term “dump” strategy is also getting popular, especially in the IT companies. Once there is a “dump” of strategy on a strategy map with four perspectives, it is much easier to discuss and share this strategy. Below, you will find a detailed analysis of the four perspectives of the Balanced Scorecard. Four BSC Perspectives online, sign-up with a free account to unlock all functions. Financial Perspective. How it’s supposed to work for non-profit organizations, how to cascade financial goals, not all finance-related metrics should be placed here. Customer Perspective. Internal and External Customers. Formulating a customer’s problem, not what the organization wants from the customers. Measuring perception. Internal Perspective. Analysis of strategic themes. Linking internal goals to what customers need. The danger or binary indicators. Learning and Growth. Improving skills and capabilities. Working on the culture. How to quantify and measure intangible goals like leadership training. We discuss typical challenges for the goals and performance indicators as well as ways to solve them. If we satisfy the needs of our customers, what outcomes will our stakeholders see? What are the typical financial goals of the for-profit organization? Developing new revenue sources by creating new products and services. This is primarily a projection of the Product Leadership strategy. 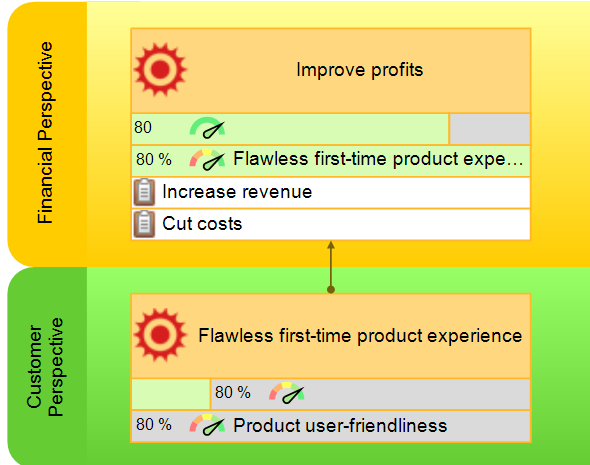 Improving current profitability by working on customer value proposition. This is primarily a projection of the Customer Value strategy. Resource optimization by decreasing costs, sharing resources and technologies between departments, or achieving economic outcomes by scaling production. This is a projection of the Operation Excellence strategy. The “finance” word in the name of the perspective might sound confusing for non-profit organizations. They are not targeting financial outcomes. Still, non-profit organizations have stakeholders; for example, the members of the community that founded the organization. In this case, the financial perspective is actually a “Stakeholder Interests” perspective or “Success” perspective. Instead of mapping financial goals, we will map there some social, cultural or political objectives. Financial goals might make sense on the level of CEO scorecard. What about lower levels? How should we cascade financial goals there? How will, for example, software developers “see” this goal? The hypothesis might be that they can contribute to cost saving by increasing the effectiveness of software testing and, as a result, decrease the number of testers needed. Where should this goal be placed on the local scorecard of software developers? “Finance” perspective – it might be confusing as it has nothing to do with finance, at least software developers don’t perceive it in this way. “Stakeholders’ Interests” like we did for non-profit organizations and put the goal there. It makes more sense. “Customer” perspective as the CEO is one of the “internal” customers. “Internal” perspective. This won’t work for me. I would agree to map in Internal perspective something like “Implement automated tests” that supports “Decrease the number of testers” goal from the above standing perspectives. “Learning and Growth” perspective. As for the previous one, here we can map some supporting goals like “Research ways to optimize testing” but not the “Decrease the number of testers” goal itself. I believe options (b) and (c) are the most viable. The specific choice depends a lot on how organizations cascade their strategy. We have discussed 12 examples of cascading – there you can find an approach to cascading that will work for your organization. Why do we map financial goals? Aren’t they obvious? The priority of one goal over another might be different in specific cases. For example, there might be simply no grow points for the developing new revenue sources (your team doesn’t have resources for this, or stakeholders are willing to focus on the main product only). An organization should prioritize their strategy accordingly, and more importantly, the organization should explain those priorities to their employees. That’s why we design a strategy map. What about other goals from the financial domain like “debt optimization”? Should it be on the Financial perspective or somewhere else? The financial nature of this goal is making this confusing. A good question to ask is whether this is what your stakeholders want from your business? My best guess is that the stakeholders want to see a financially stable business, but most likely they don’t care (and don’t have any control) about specific financial instruments. Another example is the “Raise Funds” goals for a non-profit organization. Should it be on the stakeholder’s perspective or somewhere else? My logic, in this case, is that the funds raised are not the final desired outcome for the non-profit organization. Customer perspective (think about partners who will able to act when they have enough funds) or the Internal perspective. To achieve my vision, how must I look to my customer? According to what we see daily, the “Customer” is one of the most problematic perspectives of the Balanced Scorecard framework. The concept of “customer” is limited to end-users only, ignoring internal customers and partners. Strategists tend to confuse the needs of the customers with what the organization wants customers to be. Below I suggest discussing these two pitfalls in detail. Let’s start with an obvious answer: customers are the end-users who pay for our products or services. That’s very close to the definition that, for example, Investopedia gives. The service provided is also not always that obvious (think about social media like Facebook and the problems that they solve). The definition of customer from Wikipedia works much better in this case – a customer is a recipient of what is provided by a vendor. They work to retain long-term relationships. Partners are the customers of the organization as well. What about departments that don’t deal with end-users? Let’s take an IT business unit as an example. They normally don’t interact with end-users directly, but still, they have many customers – internal ones. The scorecard for IT will be focused on serving those internal customers. Let’s summarize the ideas about customers. Internal customers, for example, the marketing department is an internal customer for the IT department. Make sure you reflect (or imply) the goals for all customer types in the Customer perspective. That’s crucial for the Customer perspective. Map here what your customers want from your business but not what your business wants from them. What is it all about? A company wants its products to be more visible in the market. Is it the customer’s aspiration? Not exactly; a customer would never formulate it in this way! Let’s look at this goal from the customer’s point of view. I’m a customer, and I’m looking for some good products to solve my challenges. I’m trying to find the product, but I’m not satisfied with the options I have. After a few hours of research, I’m happy to finally find the product that matched all my needs. I wish it could be easier to find such an excellent product! It’s the variation of the same goal, but now we have reformulated it in a way that customers actually perceive this goal. Off course, this is our hypothesis, and it’s better to support it with some studies. This looks like a mental trick, but it works. The goals formulated from the customer’s point of view are more realistic; their essence is not hidden behind business jargon. By matching the “theme” column and “stage” raw, we can focus on different strategies. Where should the focus of your organization be? It depends a lot on your business model and current market conditions. Tim O’Reilly shared a detailed analysis of startup strategies , including Blitzscaling. Take AirBnb as an example; they obviously focused on market share doing it before competitors would copy them in Europe. What is a good strategy for a more classical business model? Taking into account that customer acquisition costs 5-25 times more  than customer retention, I would suggest aiming to achieve excellence in customer retention first. Find what’s working properly and what needs to be improved. Analyze where your product wins and loses to the competitors. For example, you might detect that your prospective users are not converting well into paying users. That’s how you see this challenge. Look at this hypothesis from the customer’s point of view. Customer perspective is that they are normally vague and hard to measure. – all these are good goals, but they are hard to quantify in the form they are presented now. The solution is to quantify the perception of the goal. Let’s take the “Easy-to-use Product” goal as an example. We can come up with some objective criterion of user-friendliness, but that’s not what end-users need. The trick is to understand how customers perceive this goal. We have discussed some ways to approach this challenge when we were talking about complexity metrics. The user-friendliness of the product might actually be perceived as product experience within two minutes when the customer is trying the product for the first time. When formulated in this way, the challenge of measurement starts getting more tangible. Instead of measuring the vague context of “easiness,” we could focus on some specific steps that lead the customer to unlock the value of the product. It is “increase the perception of safety” not “increase safety”! Instead of focusing on the vague concept of safety, the priority was on understanding how inhabitants perceive safety and improve accordingly. Another typical example of how the service is perceived is customer satisfaction in healthcare . Customers rate higher those doctors who were more attentive, rather than those who were able to provide a better medical solution. The reason is obvious: patients are not able to recognize good service from a medical viewpoint, but they could recognize excellence in general care. The quality as perceived by the end-users is important. Also, we should remember other stakeholders. In the case of healthcare, those will be the doctors, the professional organizations, the regulators;, their perception of the quality will be different. This perspective explains how the company is going to satisfy customer needs and meet financial goals. In other words, you are doing something inside your business not because you can, but because your best-educated guess is that it will lead to satisfying the needs of the customers. Again, three strategic themes will help to prepare a framework for brainstorming the goals for this perspective. Let’s review them one by one. I guess any organization wants to innovate, but aspiration to innovation doesn’t mean that the organization is ready to innovate. The challenge might be to find required resources, align innovations with the needs of the clients, or simply have enough new ideas to try. Decide what goal to map depending on where your business is now. You know what your customers need Map specific goals to develop new products or features. You have many ideas, but you’re not sure which one should be the focus Map the goal to implement a systematic approach to innovations. Having a separate scorecard for innovations is a good idea. Have no ideas yet You don’t have enough information to decide, but you probably know what pieces are missing. Focus your learning and growth efforts respectively. Formulate questions that would clarify what your priorities should be. Improve customer relationship management systems, for example, the company’s activity in social media. Improve customer support service, can be a call center that handles customer queries. Improve customer interaction, for example, the way a company listens to its customers when innovating. Strategy and respectively business goals are tailored according to the vision of the founder, CEO or strategist. If most companies are listening to the customers, it doesn’t mean that you need to follow their strategy. Probably, your solution to solving the same challenge will be completely different. How are you going to listen to your customers? Will you do it in Apple’s style? What can a company do to decrease costs of operations and cycle time? How does a company define operational efficiency? What can it do to improve it? How can a company ensure high standards of quality and delivery time? How can a company optimize its supply chain? How can a company scale business operation? What could we do internally to ensure this experience? In our case, it was a real situation. One day, our team discussed this question. We found out that our challenge was somewhere between the interface of the product and effective customer support. Making the product easier to get started (anticomplexity was one of the main themes for product development). Achieving excellence in product tutorials (now we have video tutorials for all features of the product). Customer perspective, and later we were able to confirm those improvements by the performance metrics. Michael Porter talked a lot about the need for the focus in the strategy. A classic example is the McDonalds Company with its focus on excellence in operations. They are doing well in terms of customer service or product, but they are definitely not a Michelin 5 star in terms of food quality. Should an organization’s strategy be focused on just one theme? Yes, but having this focus doesn’t mean that we forget about other challenges. The focus on certain strategic themes means that the organization does something very well (operations in McDonalds), and other themes should be on a good level accepted by the customers. Internal Perspective is the use of binary or checklist-style indicators. The problem with binary indicators is that they don’t give us much control over what is happening. Their function is limited to informing the team about the fact that something has been accomplished or has not been started yet. The actual problem is with the goal! The indicator is a measurement tool for a goal. If we have a binary indicator, it means that its parent goal is not ambitious enough. Think wider and formulate a similar goal, like for example “Engage with Customers Effectively.” The specific tool (a CRM) will come and go while your intention to better interact with the customers will be developing. The “Implement CRM” goal is not ambitious enough for a strategy scorecard. Convert short-term goals into initiatives. Look at the new goal “Engage with Customers Effectively.” Does the binary metric “Implement CRM” make sense now? No, we need to focus on the engagement metric instead. The engagement metric will show how the new CRM improved customer behavior is used. What about “Implement CRM” – if it is not strategic enough to be on the Balanced Scorecard, where should we put it then? The answer is simple: in the supporting documentation or the initiatives aligned with the goal. The workshop exercise discussed above shows that CEOs agree on the importance of tracking the pulse of the industry and keep learning. To survive long-term, a company cannot make a bet on its tangible assets – the computers that we use now will be outdated soon, the technology that we use will be disrupted, even business real estate might change its role – think about more employees who prefer to work remotely, and more business meetings held online. Learning and Growth perspective, we focus on the intangible aspects of the business – skills of our team and our culture. How must the company learn and improve in order to achieve its vision? Below, we discuss them in detail. Look at the objectives in the Internal perspective. Does your team have enough skills to achieve those objectives? Within this theme, we explore what information systems (CRM, ERP, BMP) our organization needs to execute the strategy effectively. In my opinion, the information system capabilities theme is rapidly moving from a Learning and Growth perspective to the Internal perspective. Any modern organization is now a technology company, information systems change their role from being a part of the infrastructure to being a part of core business competency, an internal product of the company. The Learning and Growth perspective sets priorities for the learning efforts, but it doesn’t mean that learning is limited to the formally described goals only. Learning and Growth perspective is there to help propagate best practices within the company. Implement proper performance measurement culture. Formulating bold goals for the Learning and Growth perspective is never an issue. Companies like to verbalize their aspirations about culture and leadership. Where is the problem then? The problem is that intangible ideas like skills or culture are hard to quantify and measure. Very often, top managers are fooled by various performance metrics that do nothing but indicate that, for example, a company paid for another expensive training. Process metrics are input/output metrics for the goal that have little to do with success factors and expected outcomes. A typical input metric for training is the number of hours that students spent on training or the budget allocated. A typical output metric is an exam score. How can a company measure, for example, leadership training effectiveness? Was it because the sales pitch of the trainer looked nice? Or was it because you wanted to solve some specific problem? I hope you were solving some challenge, and even more, I hope this challenge was on your strategy map before you decided to do the training. If the challenge was on your strategy map, then we can try to quantify it. For example, was it high turnover rate among top performers that made you think that the leadership arsenal of your team needed to be revised? Great, if the training was a success, I guess we can expect the value of the turnover rate to go down. The same happens with the leading metrics. The number of training hours metric won’t work for me. Give me something that will ensure the success of the training. Just a quick remark: Intrinsic motivation is one of the success factors for soft skill training. Does your team have this kind of motivation? Did your team prepare a list of the typical challenges that they want to discuss with their trainer? We have discussed the four perspectives of the Balanced Scorecard. I hope you have mapped some good business goals and aligned performance metrics with them. A few words about the calculation for the resultant scorecard. Learning and Growth perspective will contribute to the leading performance of the goals from the Internal perspective. That’s a natural flow of the performance that we discussed in the Scorecard 101 article. Obviously, there could be more leading metrics on all levels that will provide additional views on the performance of the goals. Here is a compilation of the most frequently asked questions about Balanced Scorecard and KPIs; hopefully, my answers will help you to get on the right track with the framework. If you ask a business professional about the Balanced Scorecard, then in 95% of the cases, you will hear that it is about “balancing” Key Performance Indicators within 4 perspectives. With these misleading ideas, people start implementing the framework, fail to do so, and come to the conclusion that the Balanced Scorecard is not for them. A short answer is, it is a strategy execution framework. Having said that, we need to understand that there is no universal agreement, either about what strategy is or about the ways to track its execution. Sometimes the Balanced Scorecard is defined as a means to articulate strategy, translate it to the line level employees, and ensure that those ideas are executed successfully. The correct spelling is “Balanced Scorecard” or “BSC.” Wrong spelling: balanced scorecard (lower case), Balanced Score Card, BSc, bsc. Who are the authors of the Balanced Scorecard? The idea was first suggested in the early 1990s by Drs. Robert Kaplan and David Norton. The website of Balanced Scorecard Institute is a must-visit reference point for historical information, as well as for practical advice on BSC. Any organization has a strategy, even small businesses and individuals, so with some modifications, the Balanced Scorecard can be used by any organization, including non-profits. According to a study by the Gartner Group, over 50% of large organizations have adopted the Balanced Scorecard. Why do businesses use it? The root of the problem is that the strategic picture in the minds of top managers is not the same as a picture in the minds of line-level employees. Studies by the Balanced Scorecard Collaborative report show that more than 95% of employees don’t understand an organization’s strategy. This leads organizations to a less effective and efficient execution. Balanced Scorecard supposes to help fix this problem by aligning top-level goals with line-level actions, and thus make the strategy execution process more trackable. Here, we have more facts about the Balance Scorecard that shed light on how widely it is used and what problems it solves. Is it about Key Performance Indicators? In its earlier versions, it looked more like a performance measurement framework where measures (not necessarily the key performance indicators) played a significant role. Now the measures are responsible for tracking strategy execution, but I’d say that the main part is a strategy map with business goals connected by cause-and-effect links. The metrics are still there, but they are not the main goal of the game. What are the key principles of the Balanced Scorecard? Find a more detailed review in this article. What is the Balanced Scorecard process? It varies from business to business and from consultant to consultant. Here is the one that we recommend for strategy execution in general, and for the Balanced Scorecard in particular. 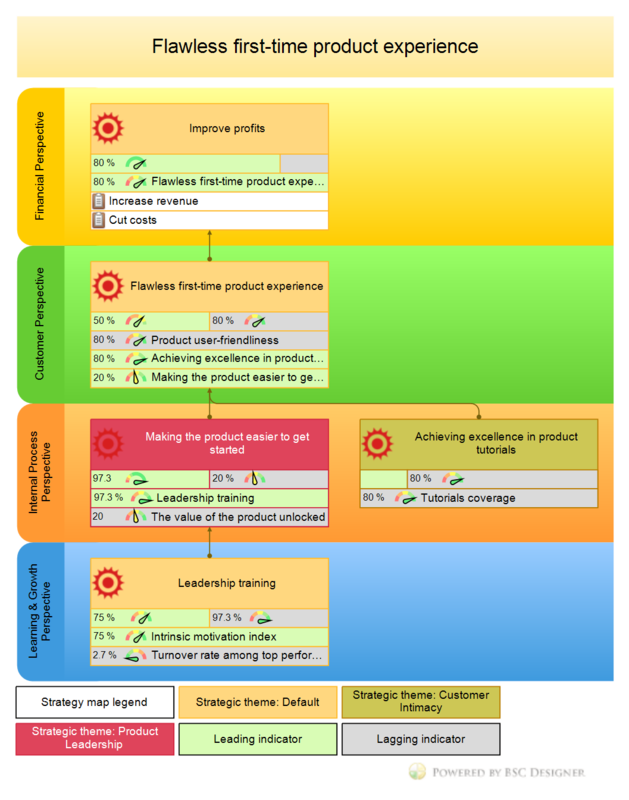 What if a company has a Balanced Scorecard with many KPIs, but without a strategy map? Balanced Scorecard is a buzz word. As with any buzz word, some confusion is inevitable. A set of 100+ KPIs is not a Balanced Scorecard; it is a KPI scorecard. It would be more correct to call those business tools a dashboard or simply a scorecard. Here, the difference between a dashboard and a scorecard is explained. Are there any approaches similar to the Balanced Scorecard? Business executives always use a combination of several tools. There are frameworks that address the problem of strategic planning and execution: Hoshin Kanri, 7-S, OKRs, Business Model Generation (see the book by Yves Pigneur and Alexander Osterwald). And for sure, there are many more supporting tools like SWOT, gap analysis, risk assessment, etc. In practice, there is always a mix of different business tools. 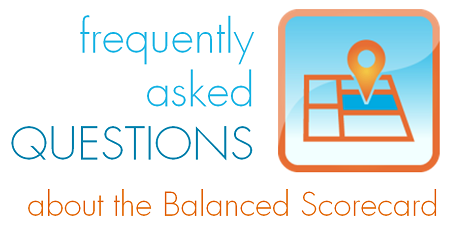 Do I need software to work with the Balanced Scorecard? In my opinion, the answer is “yes.” Otherwise, you are at risk of spending more time on the design and might face motivation problems. Check out our shopper’s guide for the strategy execution software. A common sense note: before getting to the automation tools, you need to be sure about your strategy and business goals. What’s the biggest challenge about the Balanced Scorecard? How can you solve it? According to our informal surveys, the biggest challenge is motivation to start using and keep using the Balanced Scorecard. In this article we discussed how to solve the problem. Another big challenge is to find proper performance measures (see the next question). How can you find the right KPIs for the scorecard? First, it is a good idea to understand the difference between metrics, measures, and KPIs. The biggest mistake would be to take performance indicators from some list on the Internet. Instead, focus first on the business goals, and indicators will appear naturally. Here is the process for the KPIs that we recommend. What does Balanced Scorecard cascading mean? The idea of cascading (in the case of the Balanced Scorecard it’s also called “alignment”) is about translating top level objectives down to the lower levels (and vice versa). The key idea is that cascading is done by business goals, not by KPIs. Here, you will find examples of some typical approaches to the cascading. How to use Balanced Scorecard for …? There are no specific rules for specific business niches. The guiding ideas that strategists use for a retail company are similar to the ideas that one will use for a hotel business. Still, having some examples is always a good idea. We have some here. Do you have more questions? Feel free to ask in the comments. Balanced Scorecard experts are welcome to add their thoughts in the comments. Let me summarize the key ideas of the article. There are four perspectives. The need to use this very order and this very number of perspectives can be proved in practice. Cause-and-effect logic is crucial. Learning and Growth contributes to the Internal perspective, the Internal perspective contribute to the Customer, the Customer perspective contributes to the Stakeholders’ Interests perspectives. The Stakeholder perspective is a safer alternative to the Finance perspective. The Stakeholder perspective will work better for non-profit organization as well as for the scorecard cascading. The Customer perspective is to map the needs of the customers. A typical mistake is to map the aspirations of the company about their clients instead. Goals from the Internal perspective should support Customer goals. In other words, your organization needs to solve problems that matter to your clients, not just solve some problems. Learning and growth perspective. Includes goals for intangible assets like skills and culture. Those goals are crucial for the long-term survival of the organization.